I was obviously very hungry when I made my tuna sandwich earlier this week. I mean, look at this beast. It was perfect, and definitely hit the spot. I’m such a sucker for tuna sandwiches. Something about them makes me crave potato chips too, I just need some crunch when I’m eating tuna I guess. Which is why I decided to load up this sandwich with crunchy vegetables the other day…to get my mind off the crunchy “other stuff”. It worked, for the most part. The best part of this beast of a sandwich is how GOOD it is for you. Look at all those veggies! And that bread…it’s a Smart Bagel. Good stuff (100 calories, 6g fiber, 5g protein), look for them. They will most definitely make you feel smart, I promise. Assemble your sandwich and enjoy! Mmmmnn! I like the smart bagels too. 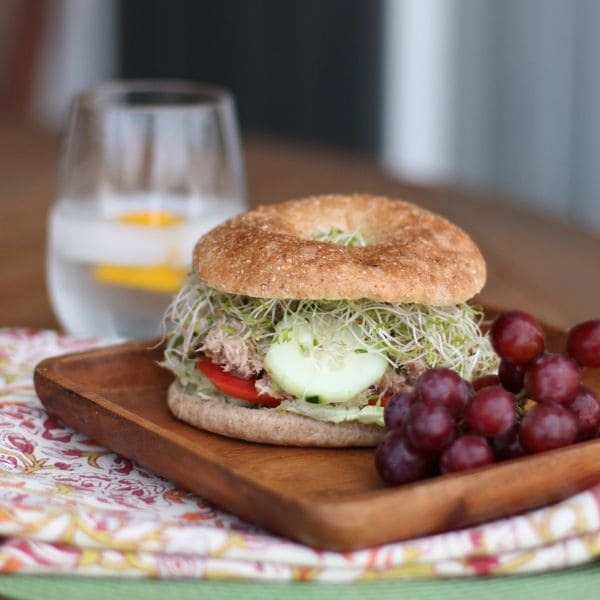 Love tuna sandwiches! I made tuna yesterday! It had been a while. Mmm! I love tuna sandwiches- pretty or not but they sure are tasty! I am heading to the grocery tomorrow and will look for the ingredients to this!!! I STINK at making myself a decent lunch…. and this will definitely cure that. I LOVE that you paired it with grapes (no points for those of us on WW) and a water with lemon. PERFECT lunch! 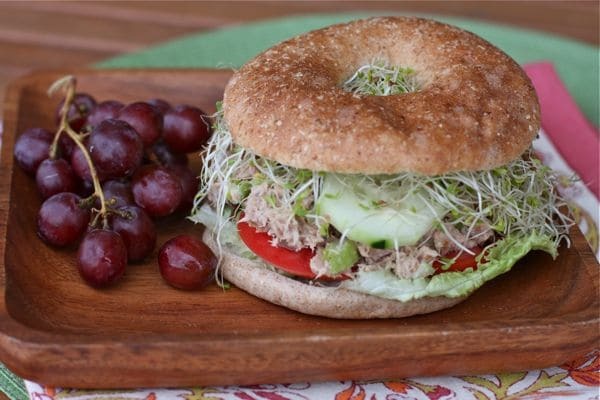 Love tuna and I should make it on a Smart Bagel like your did, looks yummy. That sandwich looks amazing, Aggie! I must have it one day next week for lunch. Looks awesome! This would be great for me to take to work for lunch. Oh, my…that’s what I want for my lunch!!!! Beautiful sandwich, Aggie! We all love tuna fish around these parts! This sandwich looks amazing. Whoa! Now that’s a good looking sandwich! Those sprouts have me drooling! yum yum yum, and I love that wooden plate! I think I know what I will be packing for my lunch tomorrow. Thanks for the inspiration! Instead of Mayo, I use Miracle Whip. Taste just as good!